Having bought it, however, I had to at least give it a try! The glass bottle is fitted with a pump (thank you, make-up gods!) which makes dispensing product easy and hygienic. 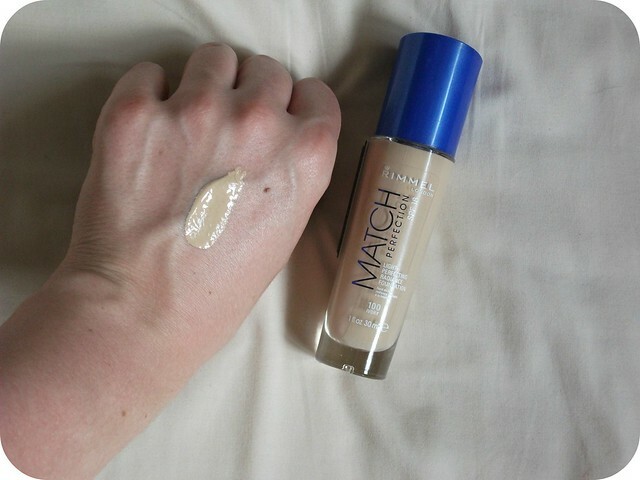 The shade I picked up, which is 100 'Ivory', is a decent match for my pale skin; I have to say Rimmel foundations generally seem to suit my skintone pretty well. The formula is quite runny, meaning the foundation is easy to spread over the skin, and it blends in easily with either fingers or my Beauty Blender sponge. The coverage, for me, is not enough. I have pretty blemish-prone skin and as you can see on the left below, it's been quite bad lately, so I need a base that will cover up these flaws. 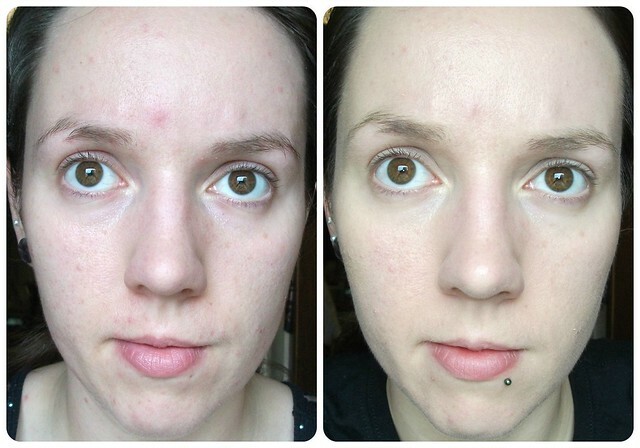 Unfortunately, Rimmel's Match Perfection Light Perfecting Radiance Foundation is quite a light coverage which is buildable to medium without getting cakey or heavy, but that's just not sufficient for me - on the right, there are plenty of blemishes still plainly visible. (Confession: I forgot to take the 'after' photo, so this one is taken the next day - a few of these blemishes had faded a lot in that time. That's also why I have my lip bar in in that photo and not the others!) If you're looking to just even out skintone and maybe hide a couple of minor blemishes, I'd have thought you'll be grand, but if you favour a more heavy-duty coverage I'd skip this. Finish-wise, the radiance claims are abundantly apparent; I hate the finish and would always, always powder it off to a matte finish. It just looks shiny, to me. I realise some people like a bit of a glow but it's not for me. In terms of lasting power, this is pretty average. I wasn't expecting it to keep my skin matte and it doesn't; I need to blot and top up my powder after a couple of hours. The coverage lasts around eight hours but once it starts to face, I find it becomes a little patchy around my nose and forehead, where the oiliness is worst. This maybe wouldn't be such a problem for the normal/dry skintypes this is presumably designed for, but if you're with me in the oily-skin-camp, again this is a reason to skip this one. 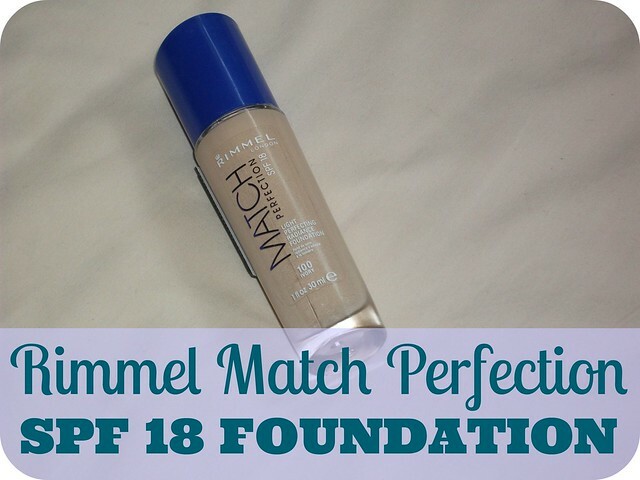 Rimmel Match Perfection Light Perfecting Radiance Foundation is priced at £6.99 for 30ml, available at Boots here. For the price I think it's definitely worth a shot if you're after a lightweight, everyday foundation with light to medium coverage, with the added bonus of an SPF thrown in, but if you prefer a fuller coverage I'd give this one a miss. What's your favourite foundation? 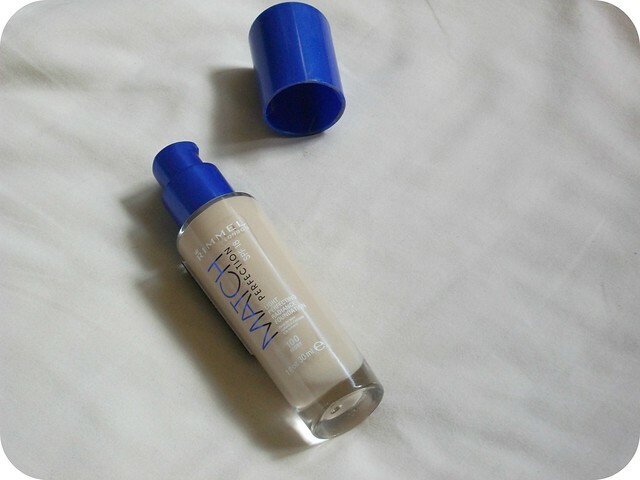 Have you tried this, or any other Rimmel foundations? As I mentioned in the post, I wasn't too keen on it to be honest. I have oily skin and I actually kinda like this. But I'm not put off by Dewey skin. This did need to be set and I did need to keep some blotting papers in my purse. But I like how flawless it looked on me. I used it with a natural matte powder and a setting spray and I have to say I really think it made my skin look amazing. I don't have anything major to cover up except for my freckles. And they peeped through the Foundation, but I didn't mind. 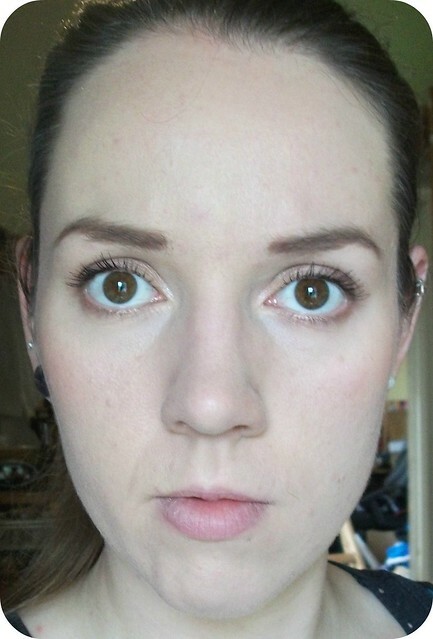 Even though I get quite oily, I'm not a fan of ultra matte Foundations, they often look cakey and unnatural on me. This actually looks quite pretty on you, but i understand what you mean by wanting a more heavy coverage foundation. It's been ages since I've tried a Rimmel foundation, I tend to go for Maybelline or L'Oreal for some strange reason! I actually have dry skin, so this formula might work for me. I'll have to scope it out next time I'm at the store! great review! i would definitely be skipping this as i don't fancy my face melting from the oils and especially this lovely heat we are currently getting!